Fly Jamaica, which had been en route to Toronto, Canada, made a crash landing at the Cheddi Jagan International Airport in Guyana this morning. All passengers and crew are safe. Six passengers have been treated for minor injuries. An official investigation has been launched. 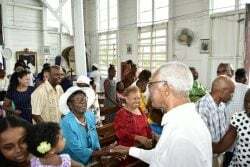 Stabroek News understands that preliminary inquiries reveal that the plane experienced hydraulic problems after takeoff and a request to return to the aerodrome was made by the pilot and co-pilot, both of whom are said to be Jamaicans. It was noted that after spending an estimated 43 minutes in the air on the way to Toronto, the plane made an emergency landing at approximately 2:53 am which was followed by an immediate evacuation of crew and passengers. Speaking at a second press briefing this morning, Minister of Public Infrastructure, David Patterson stated that an investigation has been launched and the National Transportation Safety Board (NTSB) in the US has been notified, and has since designated an accredited representative to assist with investigations. 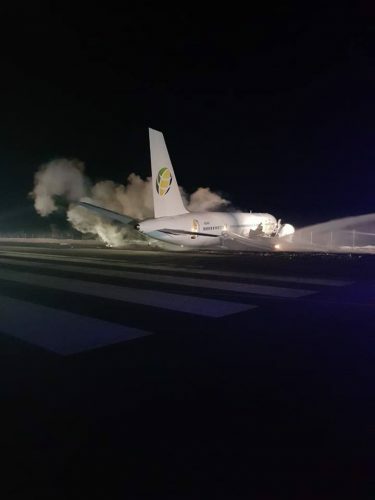 This image of the plane from the CJIA Facebook page appears to be of the plane at the point of impact this morning. 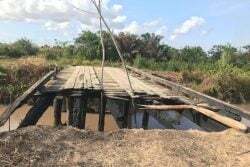 Leading the investigation is Aircraft Accident Investigator at the Guyana Civil Aviation Authority (GCAA), Paula McAdam who will be assisted by inspectors from the authority. It was also reported that both the black box and flight data box have been secured and will be sent off for decoding as soon as possible. 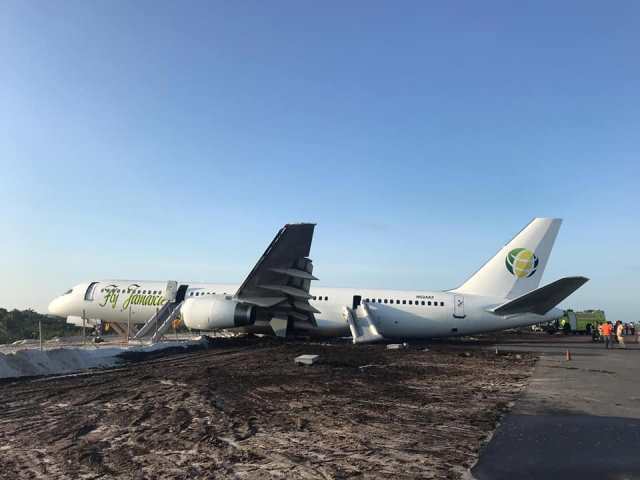 Patterson also noted that the Fly Jamaica aircraft would have ended up in an almost exact position as the Caribbean Airlines plane that had overshot the runway at Timehri and crash-landed in 2011. He noted however that though that section of the runway was not opened to airport traffic, the existing extension saved the plane from suffering the same fate as the CAL aircraft which broke in half. Stabroek News understands that passengers on the flight included nationals from Pakistan, Trinidad, the US, Canada, Jamaica and Guyana and that the GCAA has begun notifying the respective governments. 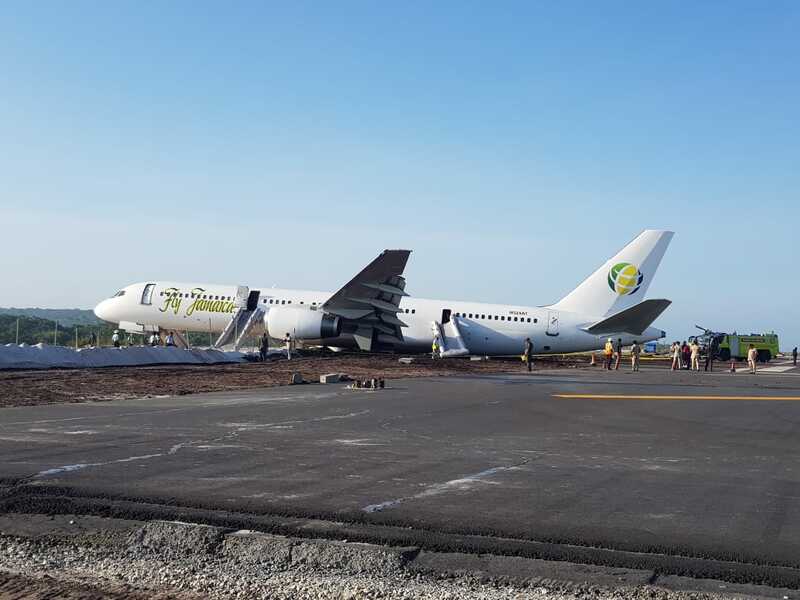 Meanwhile, it was noted that of the 128 persons on board the aircraft at the time, six were taken for medical treatment following injuries sustained while utilizing the emergency evacuation slide. According to Chief Medical Officer Dr. Shamdeo Persaud, who also attended the press conference, those who required medical attention were initially transported to the Diamond Diagnostic Centre, however, several of them have since been transferred to the Georgetown Public Hospital for additional tests and treatment. Chief Executive Officer of the Cheddi Jagan International Airport Ramesh Ghir said that the runway has been reopened for used but that that some flights were diverted. Also attending the press conference were Minister within the Ministry of Public Infrastructure Annette Ferguson, Director General of the GCAA Egbert Field, and Commissioner of Police Leslie James. The Fly Jamaica plane at the CJIA this morning. News wire service, Reuters is reporting that six passenger were injured. It said that the Boeing 757 had been in the air for about 20 minutes when the pilot indicated it was experiencing problems with its hydraulic system. CJIA says it has has set up a hotline – 261-2281 or 600-7022 – for family members for assistance and information. “Fly (Jamaica) plane flight OJ 256, departing for Toronto just crashed landed at Timehri airport Guyana, everyone evacuated safely, I am all safe , but shaking up, we were in the air flying for 15 minutes and captain said there is a hydraulic problem, and turned the plane back to Timehri, captain dumped fuel and then landed”. 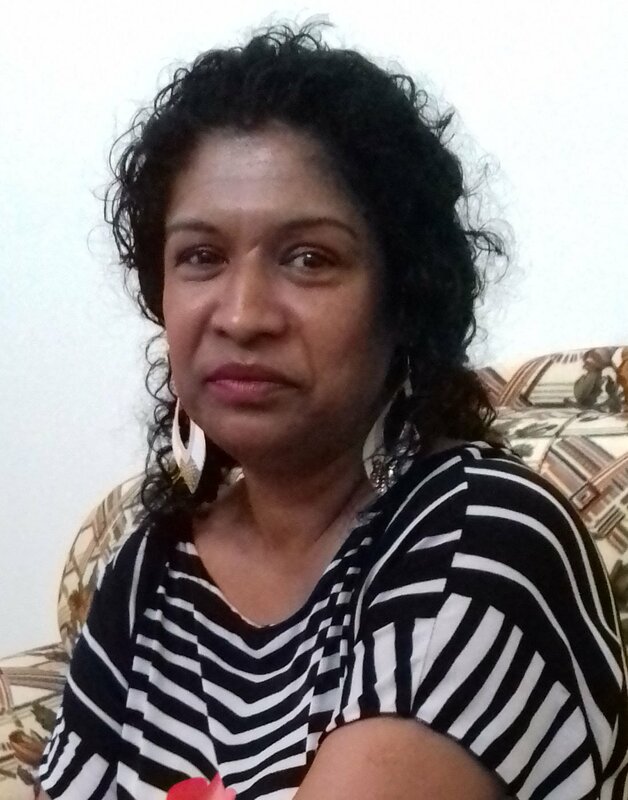 According to a report on the Canadian Broadcasting Corporation (CBC) website, Rabina Roopnarine got a call from her mother, Bebe Ali, who was among those on the plane. Ali, a resident of Toronto, flew to Georgetown two weeks ago for her brother’s funeral. She was supposed to land at Pearson International Airport in Toronto today. Ali, CBC said, used a flight attendant’s cellphone to contact her daughter from the hospital shortly after the crash landing. Roopnarine said she was told the plane was filled with smoke and passengers were trying to force their way off. lAli, the report said, injured her neck and back sliding down the emergency chute, her daughter said. 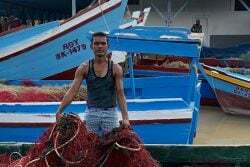 “She just wants to come home,” Roopnarine said. 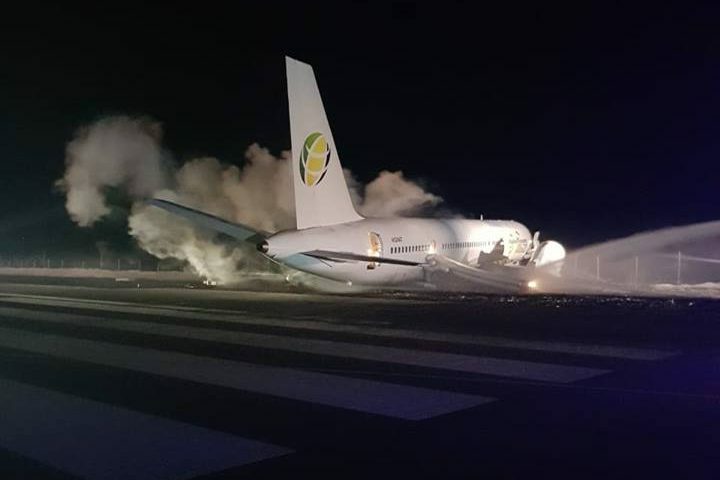 More pictures from the scene of the Fly Jamaica Boeing 757 aircraft at Georgetown Cheddi Jagan Int'l Airport. She said Fly Jamaica has been providing frequent updates via its social media channels. 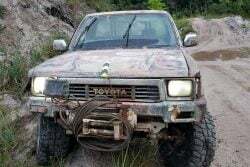 CBC said that a representative from the U.S. National Transportation Safety Board is expected to assist in the probe. Boeing Co is looking into the incident, a spokesman said, according to Reuters. On June 30, 2011, a Caribbean Airlines plane overshot the runway at Timehri and crash-landed. There were some serious injuries but no fatalities. Fly Jamaica launched operations on 14 February 2013. It is headquartered in Jamaica. One of its key principals is Guyanese aviator, Captain Reece, the chairman of the airline.